It’s always nice to work on nice things, and when Michelle brought us her Dimond Marquise, we were honored and excited. 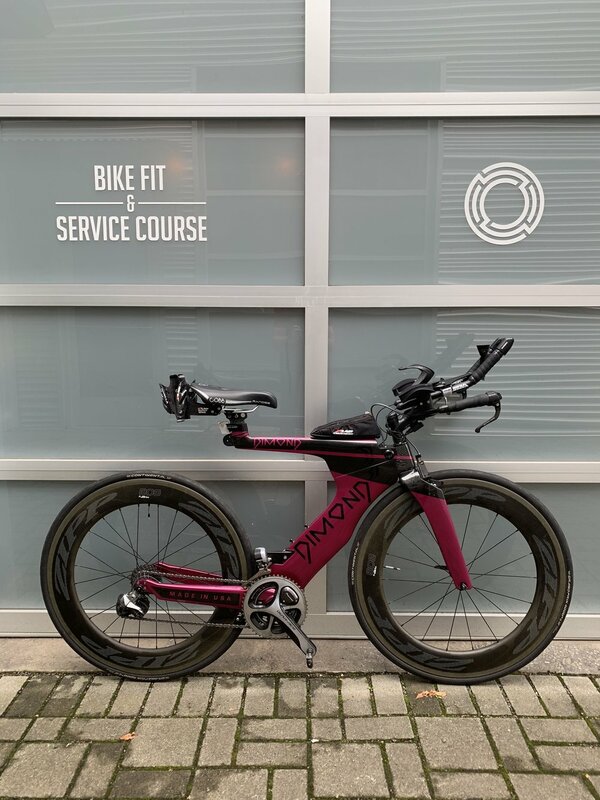 Michelle came to us with several of the issues we often see (saddle discomfort, low-back tightness), and in our initial fit we went with many of our usual moves: dropping the saddle a little bit to alleviate an aggressive position, while rotating the aerobar extensions upwards to relax the torso. Fit accomplished, Michelle asked us if we could then fix some of the resulting equipment imperfections. As you can see in the above picture, our aerobars are in the right position, but since we are working with a base bar that doesn’t move independent of the extensions, the pursuit bars are now sub-optimal, putting Michelle’s wrists in an unsustainable position. Since we were going to change the front end, that also gave us a chance to clean up that bird’s nest of cables sitting in the space behind the steerer tube. 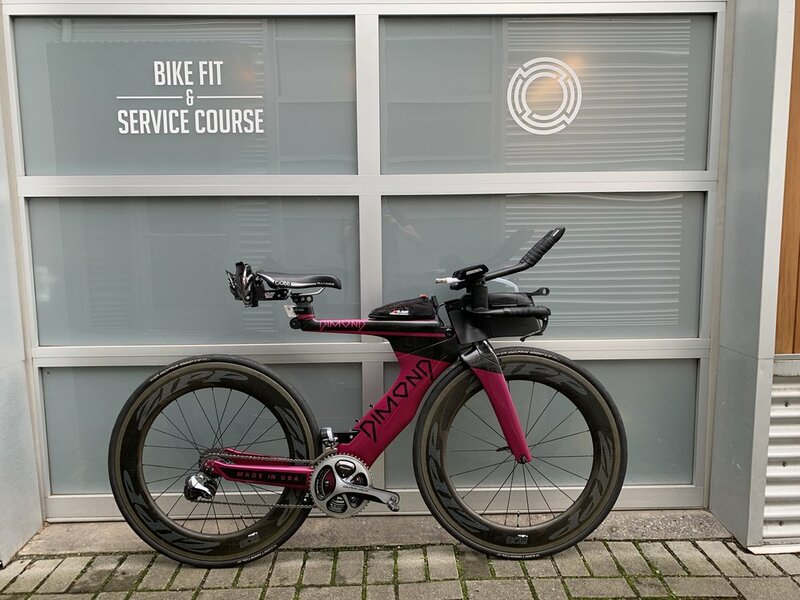 Josh went to work, first suggesting the Aeria Ultimate Profile Design bar that both he and Chris have on their TT rigs, second making some changes to Michelle’s bike to accommodate those changes. Once that step was complete, Josh made some room in front of the head tube for the Aeria hydration system. The Dimond comes with a slick front brake cover that is secured in place by magnets, but the top of the cover interfered with the bottom of the Aeria bottle. Dremel in hand, Josh carefully went to work. Hydration system and bars installed, Josh set about cleaning up the cables and finding a place for the Di2 junction box, always a bit of a puzzle. Josh punched two small holes in Michelle’s bento box, and then ran two tiny zip ties through the junction box cable-ports, installing the whole thing onto the leading edge of the bento. He only needed two Di2 cables, due to some clever wiring inside the aerobar, and then he finished the whole thing up with some shrink wrap, cleaning things up remarkably. Remember, this (below) is where we started! This kind of treatment doesn’t have to happen after a fit, however. If optimizing your bike for wind resistance, cleanliness, and peace of mind, then think about our Service Course service: we’ll treat your bike like a pro’s bike, and send you out of here not worried about cables, hydration systems, bottle cages, or anything else that can clutter up your rig.